this update is mainly about improvements on the visual experience of the game. I figured out quite a few things and wanted to share them with you. Also, a possibly useful function for spectators to detect cheaters has been added: Bullet highlights (see illustrations below). - Added: Option "Fix menu flickering (may improve performance too)"
- Added: Option "Multisample Anti-Aliasing"
- Added: Option "Disable player LODs"
- Added: Option "Fix Z-fighting"
- Fixed: Direct3D 9 Error "GetAvailableTextureMem"
This option may fix flickering/disappearing of the menu (Windows 10?). This is because the menu is now drawn as a texture instead of a lockable backbuffer. Great update indeed. The bullet-tracing feature is just awesome and administrators will appreciate it for sure, but I've run into some problems and I'll try to describe these here as detailed as possible. 1) Highlighting bullets (bullet-tracing) does not work in replay mode. I'm not sure if it's supposed to work in replays, but that could be useful too. My PC with AMD FX-6300, nVidia GTX 650, 8GB RAM, Windows 7 Pro 64-bit. GeForce driver v. 355.60. My notebook with Intel i3 2330M, switchable Intel HD 3000 / nVidia GT 630M, 4GB RAM, Windows 10 Home 64-bit. GeForce driver v. 353.62. As it seems, this issue is related to nVidia GPUs only. With the Intel HD 3000, everything is working flawlessly. The new options make no difference, same in FullScreen/Windowed, also tried unchecking everything else but the texture filtering and the issue still persisted. And just to note: forcing MSAA does solve the FullScreen flickering (only happened to me with GT 630M) and it is quite heavily performance demanding (as expected). So it's not suitable for weak integrated GPUs. Nosek, thanks for the report! It would be great if you could be available for testing possible fixes. EDIT: Brchi fixed that issue, now let's just wait for update. Thanks again Nosek for your detailed testing. Thanks, just tested in windows 10 and I must say that it works well. To tell the truth worked well with the previous version of video card AMD HD 5xxx series. In this regard the option "Correct aspect ratio": works in native resolution only. what it allows you to use non-native resolutions full screen mode without problems. Hi! 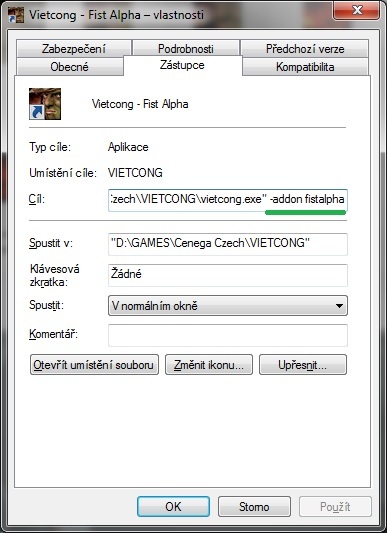 Everything seems to work, but now I can`t change the game with the Vietcong - Fist Alpha on, and vice versa via the menu of the game. @evgen: You don't need to use the "Custom Game" option in the game settings menu to activate the addon you want to play. For instance: -addon fistalpha or -addon addcong, -addon reddawn etc. What exactly happens when you change it? He throws on the desktop and everything. In Task Manager, it either. It should close the game and reopen it. I could have a look via TeamViewer, if you want. I also confirm if you try to activate custom game vietcong.exe crash. Unfortunately it seems the same thing, not any different, choosing custom game Vc crash again. Make sure you are using the new version. In the game menu you should see > VCStarter v1.65.1. I use the Italian version in Windows 10 and are sure to use VCStarter v1.65.1. How do I attach a picture ??? In win 7 it works well. I think I understand the problem. I did not install the game on Windows 10 I use the same to win 7. Probably the system does not recognize it.